Cooking Hacks, is the open hardware division of Libelium (the creators of the Waspmote and other wireless sensor devices) and their latest project is an e-Health sensor kit that piggybacks on the Arduino and Raspberry Pi platforms. 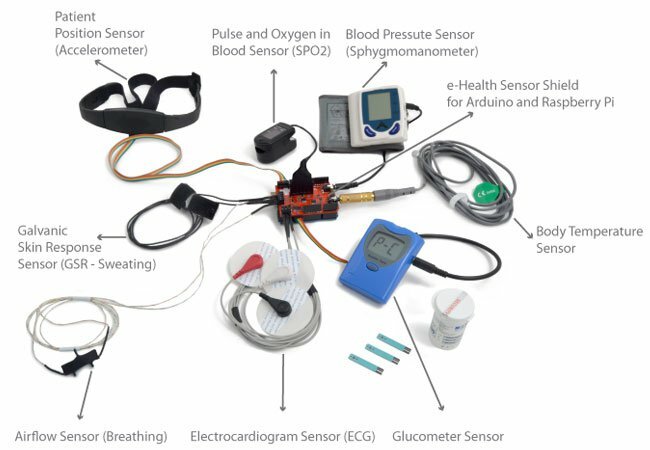 With the kit and associated documentation they hope to give researchers, developers and artists an easy way to measure biometric sensor data for their projects and inspire a new era of open source medical products for everyone. Nine different biometric parameters sensors are offered including; pulse, blood pressure, oxygen in blood (SPO2), electrocardiogram (EKG), airflow, glucometer, galvanic skin response (GSR), patient position and body temperature. Mobile apps for the iPhone and Android have been created to help users visualize the data in real-time, and a complete kit featuring all of the sensors is available today for €290. If you are interested in learning more, details and the complete documentation and code samples for the sensors and shield can be found here.